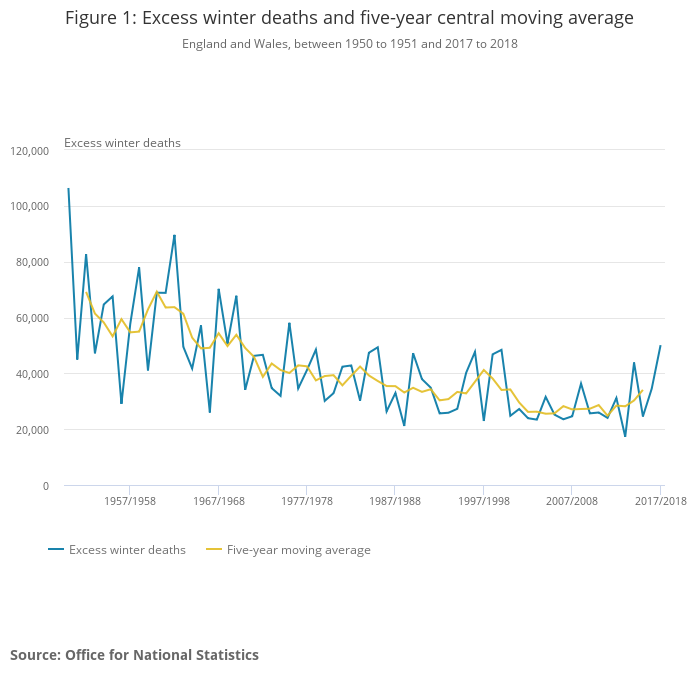 “The number of excess winter deaths in England and Wales in 2017 to 2018 was the highest recorded since the winter of 1975 to 1976. However, peaks like these are not unusual – we have seen more than eight peaks during the last 40 years. It is likely that last winter’s increase was due to the predominant strain of flu, the effectiveness of the influenza vaccine and below-average winter temperatures”. Although the effectiveness of the flu vaccine was undoubtedly a major factor in the rise in EWD, the figures are a reminder that cold kills. But what is particularly interesting in this latest edition is the summer mortality stats. Death rates in June and July, when the heatwave peaked, are virtually identical to the five-year average (which does not include this year). Actual daily deaths were 1281, against the five-year average of 1279. Do they do anything intelligent with these figures – e.g. calculate excess deaths among the over-70s per 100,000 of same? There is quite a bit more detail. eg by region, or by cause. The march to more expensive energy will leave more old age folk dying in their flats as they are too scared to turn on the (expensive) green heat. Interesting. When it really gets hot in France 33c plus the deaths do go up. However, when we returned from France early in July it was hotter here. A first. “Ineffectiveness” or “level of effectiveness” of the flu vaccine? If some of the premature deaths are linked to the flu surely the flu vaccine wasn’t effective. If the population in the oldest decile/quartile age group is higher than in previous years then those in that group are likely to succumb to extremes of temperature at a greater rate than previously unless exposure to extremes itself is reduced by management or otherwise. When it is hot, one needs to stay in the shade, have some water, and do as little as possible. When it is cold, doing the same will kill you. Strangely though the advice is to drink a hot drink to cool down when it’s hot – it opens the sweat pores – and a cold drink when it’s cold – to close them up. The former encourages sweating, the bodies natural mechanism to cool down and the latter retains body heat as there is no moisture to evaporate from the skin. 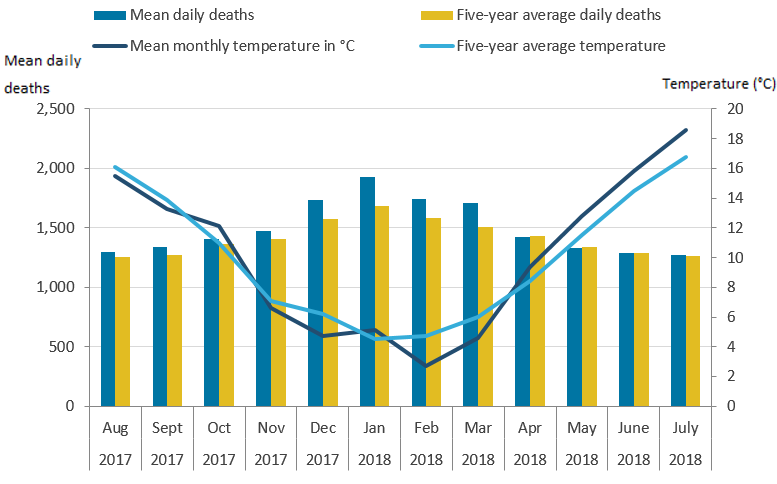 Following the recent announcement of a study suggesting climate change has already resulted in excess summer deaths, I had a look at the numbers. ONS/Met Office were able to supply plenty of data on excess cold weather deaths but very little is available on deaths due to excess heat, so I don’t know where the researchers found the data to support their thesis. Can we get the names of some of these 50,100 excess winter deaths? Or did someone pull this number from their arse? Estimated deaths is bad science. It’s actually a bit more scientific than that! It is a statistical product, and not a determination of cause of death. On the Radio 4 business slot around 6.20 this morning a spokesman for the steel industry stressed how hard it is to compete with countries such as France where he claimed electricity is half the price of Britain’s. He also pointed out that more of the green costs are loaded on to industrial rather than domestic users in Britain than elsewhere. So we are both crippling our heavy industry and causing more deaths among domestic users, all to combat a probably non-problem of climate change. By loading it on industry it makes the taxes less visible to the general public so that they are less likely to don gilet jaunes and take action. The energy companies are shamelessly vague about how much of our bills are global warming taxes. Any taxes on companies are either passed on to customers or result in lower wages, less staff and less investment – there is no magic money tree like the communists Corbyn and McDonnell believe. And the stitch-up deal that May and her morons have agreed will lock in global warming taxes as set out in the non-regression section. No free trade agreement can possibly remove the Irish border problem so the backstop will remain in place, ensuring the damaging costs are levied on our industry. A good statistical analysis Paul. Cold kills, we all know this. The conundrum, what is a mystery, how a so called advanced economy would eschew all logic, and a logic our forefathers understood so very well that, heat and warmth and freely available is, an absolute necessity living on an island: at 52º + N.
That the UK, the whole administration would succumb to a man made politically inspired myth. Then, think it wise to fashion and then throw a spanner in the works of efficient supply and utterly trash the effective provision of gas and electrical delivery, I mean wot’s up doc? Yeah, unless of course the PTB on the say so of some egregiously misanthropic and shady but very powerful vested interests and with the full blessing of the shills sitting on both the green and red benches hate their fellow countrymen so much that they cocked it up – and surmised quite deliberately. See what they do, know them and reject all their works and words, its blizzard of lies, they never had your best interests at heart, saving the creepy crawlies, or coral reefs plus the polar bears too of course always a priority but over human beings welfare – are these eco-gits for real? The British must fight back and say, you know what you can do with your ‘green priorities’ – there’s a dark place for them, ready and awaiting. Has there been a positive comment from David Attenborough? He longs for population reduction, himself excepted, of course. Regarding the “Fear Campaign” and health, the BMA have produced a paper to help brainwash medics about the health risks of AGW, that badly needs Paul’s analytical response. The paper is at first glance serious and scientific until you see that all the doom and gloom is model-based and the advisors are activists. If that does not work, I have a pdf copy. For some reason it links to my post on Excess Deaths! Paul, I’m going to write to the BMA about their misguided political science and infiltration by lobbying groups, but thought that you could produce a far better critique than I can. Can send the paper as a pdf, but don’t know how to attach.